Fun things for children to do to encourage Outdoor play. Get outside and enjoy the green open spaces and learn to appreciate nature and wildlife. 3 March – Happy World Wildlife Day! Green play at the Sun and Moon! The Family Festival for 2014! Worthing is on the map! 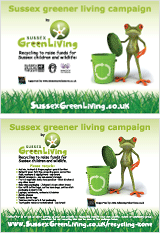 The Project Wild Thing film is coming to Sussex on 6th March! Project Wild Thing is a movement to get more kids (and their folks!) outside and reconnecting with nature.